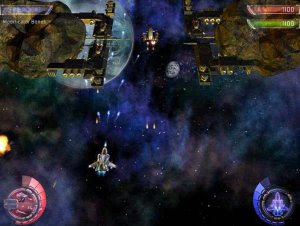 If you have not played Deadly Stars, you have no idea what a cool space shooter is. Using advanced 3D technology. Deadly Stars features top-notch graphics, excellent sound effects and tons of blasting fun. The question is can you handle so much space fighting? Deadly Stars is not just any top-down shooter. This game not only features classic gameplay but amazing graphics, which aren't just eye-candy, and an interesting strategy element. You play the role of a pilot whose mission is to battle through the rogue Emperor's pirate armada which has forcibly seized power. You must inform the imperial troops about the rebellion, but they are quite a distance away and your path is blocked by the enemy. Luckily, your ship is designed for long-term travel, which translates into a huge capacity for firepower.